While suspenders are attractive, practical and interesting accents to any outfit, we think they make an especially dapper addition to tuxedos and other formal attire. A staple in anyone’s closet, dress suspenders are an ideal accessory to wear to upscale events like weddings, proms or business meetings. They come in both clip and button styles, and a wide range of fabrics and patterns to fit your unique style. Not sure how to wear formal suspenders? Use this SuspenderStore style guide to learn everything you need to know. Clip vs. Button Suspenders Either clip or button suspenders make an elegant addition to your special occasion ensemble. 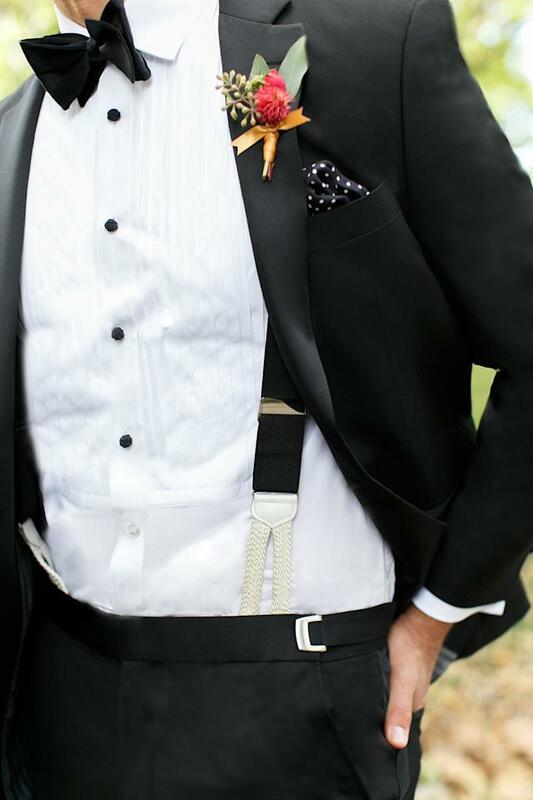 Clip suspenders are often chosen for wedding parties for their ease of use - just open the package, clip them on - and presto - your groomsmen look awesome! Clip suspenders are also a great choice because they come in a huge array of colors so it is easy to find the perfect shade to tie into your bridesmaid dresses or to create a fun and colorful splash of color. Gold- or silver-colored hardware gives clip suspenders an elegant look that can take you from casual to dressy occasions. However, for a more formal or black tie look, button suspenders are the way to go. Button suspenders give the classic finishing touch to formal attire. Some button suspenders feature high quality leather accents while others feature woven fabric - "runner-end" - attachments. These high-end tuxedo suspenders are made specifically for suit attire and provide a sophisticated and polished look; however the runner-end attachment is considered by fashion experts to be the dressier of the two options. Most tuxedos and many business suits come with buttons already sewn into the waistband of the pants, so choosing to wear button suspenders does not necessarily mean additional work. If you find that your pants do not have the appropriate buttons already in place, you can easily sew them on yourself, or take your pants to any skilled tailor who will know exactly what to do. X-Back vs. Y-Back Suspenders Suspenders come with either an "X-back" or "Y-back" construction. X-back goes down the back and crosses over to the other side, while Y-back has shoulder straps that combine at the mid-point of the back and then go into a single strap to attach to the pants. For formal events, Y-back suspenders are often preferred because many consider them to be more formal and stylish. Additionally, button-suspenders almost always feature a Y-back. However, X-back suspenders offer better support which can be especially important if you’ll be wearing your suspenders for a long event like a wedding. There is no right or wrong choice here - choosing which style to wear really depends on your own preferences. Solid vs. Patterned Suspenders Solid colors are the most versatile choice for formal suspenders and braces. Black suspenders go with everything, especially tuxedos. For the most upscale “black tie” event, choose black silk suspenders with button attachments and a Y-back. The sleekness and slight sheen of silk is perfect for taking a basic ensemble to the next level. In addition to solid black or white suspenders, there are numerous "tone-on-tone" options available in formal silk and jacquard suspenders, which provide the simplicity and elegance of a solid color suspender but add some interest via a subtle pattern. Tone-on-tone patterns available in our silk formal suspenders collection include paisley, stripes, and basketweave, while our formal jacquard suspenders come in checkered and diamond patterns. In addition to black, dress suspenders are also available in rich colors like burgundy, navy, and ivory in fine fabrics including grosgrain, silk, jacquard and french satin. If you want to add even more pizzazz to your formal style, look at patterned suspenders. SuspenderStore features a range of smart patterns, including paisley, stripes, polka dots, herringbone and even exquisitely detailed themed braces made of vintage ribbon or handwoven silk. In a calm and gentlemanly manner I say your suspender DESIGNS are outstanding and whenever worn I am complimented on them and asked where they could be bought. Now the challenge for you and anger by me. After one, yes one, two or three times of wearing any one of the 10 or so pair I bought at one time, the thin metal adjustment clip (not tooth side) to which the observer sees falls off. The design is inferior in length or design or thickness to keep the axle attached to the other side and obviously makes the suspender not adjustable. Aside from a great idea and otherwise nicely made, this clip manner is inferior and will preclude further purchases or recommendations. I’m sorry for the delayed response to your comment on this – we get a lot of spam in response to our blog posts and your comment got lost in mix. Your complaint is one I have not heard before in regards to our suspenders. Are you sure you purchased them through us? We take pride in our products and strive for high quality clips and adjusters. If your adjusters are failing on products you purchased through us – please call our customer service line – 800-393-4508 – to discuss so we can remedy the situation. Thank you for your input.